Ultrasound Technician Salary Guide 2017 - How Much Can They Make? Ultrasound technicians can be found in many areas of the medical field. Not only can they specialize in pre-natal imaging, but they can also check vascular, cardiovascular and other organs throughout the body. They’re a specialized niche within the medical world that require extensive training and licensure to practice in their particular state of choice. Both Bachelor’s and Associate’s Degrees are offered, as well as specialized training and certifications. This is a rewarding position that provides the person with a head start in the healthcare field. The pay is also a nice bonus of being able to perform this type of work. According to the US Bureau of Labor and Statistics, the median annual salary of an ultrasound technician is around $63,630. $30.59 per hour is the median hourly wage. Keep in mind that depending on where the person is working, the rates may be higher or lower. The earning potential for an ultrasound technician can go as high as $94,000 and counting. These higher salaries go to those that have more experience and years doing the job, have supervisor roles, master’s or bachelor’s degrees or have advanced specializations that they work on. 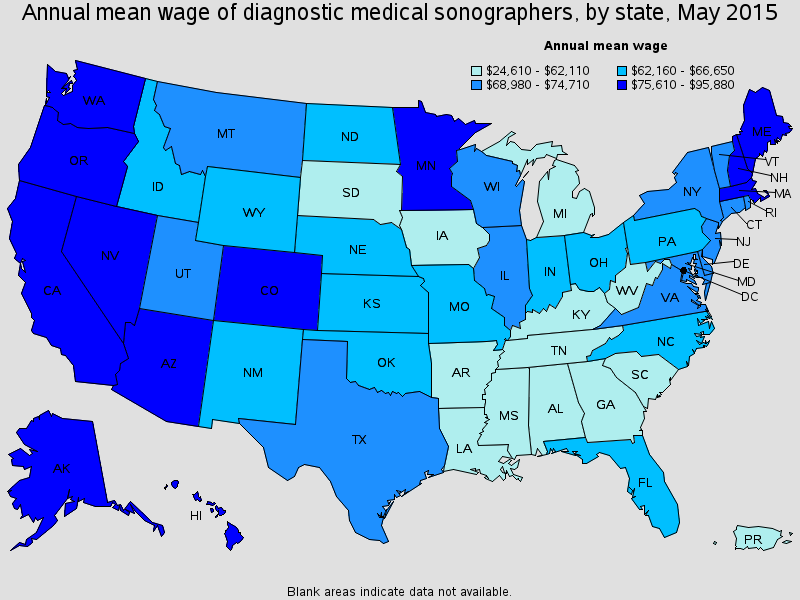 An ultrasound technician’s salary is higher than other careers out there. This is especially true for those that continue to provide services for a number of years, work within a great work environment and choose to go for an advanced specialty, rather than being a general ultrasound tech. Is There a Demand for This Profession? There is a high demand for ultrasound technicians throughout the growing healthcare field. With the job outlook expected to rise up to 46% within the next 10 years, many healthcare facilities are looking for professionals to fill the roles. Many of these facilities are relying on these professionals to provide answers in a less invasive and more affordable manner, such as sonography. What Does Job Growth Look Like? Job growth is expected to rise close to 50% more than it currently is. This will make way to hundreds of thousands of positions open for those looking to advance into the career of an ultrasound tech. With technology advancing and the need for more affordable tests, as well as many baby boomers retiring, the position is set to leave numerous spots opened within many different healthcare facilities, both needing general ultrasound techs and specialized ones. Since there is an increase in need for ultrasound techs, there is currently not much competition when it comes to finding a position. With the need to fill these spots throughout the country, a recent graduate can expect to obtain a spot within one of the healthcare facilities quite easily. A few different places hire ultrasound technicians, both experienced and entry-level. Can I Advance My Career? There is room for advancement when you choose to be an ultrasound technician. One of the biggest career moves that these professionals can take on is specializing in a particular field. This provides the technician with not only a generalized ability to provide the sonograms, but also a specialized field that allows them to explore one area of the body over another. For example, pre-natal or cardiovascular. Taking additional classes to further your career will be necessary when specializing in an advanced placement. Through the use of these classes, you can then become certified in the particular specialty field of your choice.